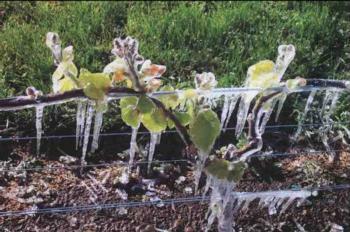 Napa County vineyards are subject to injury from spring frost. Richard Snyder , UC Cooperative Extension Biometeorologist, provides information on frost protection, including topics such as frost protection techniques and dew point calculations. Double pruning is a cultural practice that can be used to avoid or minimize frost damage to vines. McGourty et al. (2010) evaluate several techniques for treating frost-damaged vines to stimulate new shoot development.